Nick Kyrgios has reached the quarterfinals of the 2015 Australian Open, recovering from two sets down to defeat Andreas Seppi, in much the same way Roger Federer didn’t two days earlier. It is the first time a local has reached this stage of their home Slam since Jelena Dokic managed it in 2009, and the first time a male player has done it since Lleyton Hewitt in 2005. For those viewers whose passion for the sport extends only to those men and women with little Australian flags next to their names, it is a rare chance to keep watching past Sunday. It is a long time since the Fanatics have had to find tickets for the second week. Some years even tickets to the second round are a gamble. Kyrgios is also the first teenager to reach multiple Major quarterfinals since Federer in 2001, which is an even bigger achievement considering that outside of Grand Slams and Davis Cup he has so far recorded precisely one tour-level victory. That may conceivably change, but for now it is safe to say Kyrgios is built for big moments on big stages. The backhand winner up the line with which he sealed the fourth set tiebreak testified to that. The way he kept barking ‘Towel, Bro!’ at the ball-kids suggests that his on-court manner needs further work, whatever you think of the rest of his behaviour. Of course, having reached the quarterfinals elevates him virtually above media reproach. Given the ratings-boost Channel 7 enjoys whenever Australians go deep, just about anything short of a baby-punching spree can be passed off as youthful joie de vivre, unless you’re Bernard Tomic. Tomic, you may recall, ‘wasted the nation’s goodwill’, and is thus one transgression away from deportation. He had also progressed to the fourth round, but was unlucky to encounter in Tomas Berdych an opponent even more ferocious than Seppi. Had it been otherwise, Tomic may well have progressed instead. As it was, his fourth round provided a succinct demonstration of what happens when a top player encounters a sophisticated game built on guile, placement and subtle variations of pace and torque. The top player just shrugs and hits right through it. Tomic sometimes looks like a throwback to an earlier era, and proves that there are plenty of good reasons why those kinds of players aren’t competitive these days. The frustrating thing is that Tomic doesn’t necessary have to play like that. Against Philipp Kohlschreiber in the second round he stepped in, controlled the baseline, and blasted winners with his weird forehand. Still, fourth round was a good result. 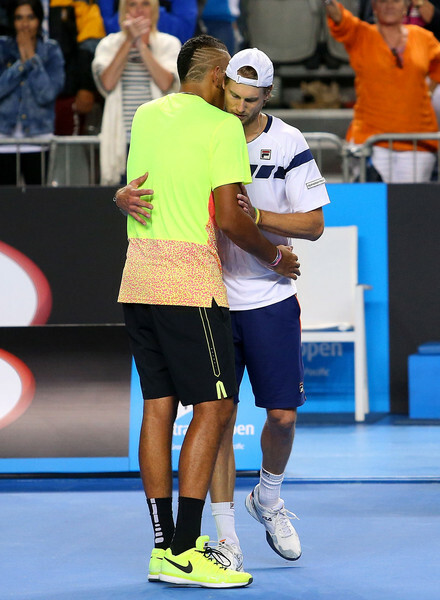 Shock of the week was undoubtedly Seppi’s four set upset of Federer, who’d numbered among the tournament favourites. It was Federer’s first exit before the semifinal stage of this tournament in over a decade. It’s hardly news that good players have bad days. What was surprising was the discovery that even great players in otherwise excellent form can have days that manage to be bad in nearly every direction at once. In the normal course of events, Federer is significantly better at Seppi at every aspect of the sport – movement, serve, return, groundstrokes, net-play, twin-fathering – which explains how he compiled a record of ten wins against the Italian for the loss of just one set. Yesterday, however, Federer was markedly worse than Seppi in just about every conceivable way. His first serve was more potent, naturally, yet his returning was such that Seppi’s modest delivery looked like Raonic’s, a musket effectively doing the job of a howitzer.